My grandfather died a year ago this past Friday. The anniversary kind of got swallowed up in the news of the day. Growing up, I only saw Poppy a couple times a year (he lived in Syracuse and we lived in Virginia - a seven-hour trek), but he always made those visits special. My brothers and sisters were greeted with a big hug and a warm smile. There were always crayons and coloring books on hand, cartoons on the television and the much-coveted Green Machine parked in the garage for the siblings and cousins to fight over take turns with. And even though he had 16 grandchildren vying for his affection, he always took time for each of us -- asking about school and hobbies. His house was not huge or filled with expensive things, but it was warm, full of laughter and love. He valued relationships and good company so much more than any worldly possessions. 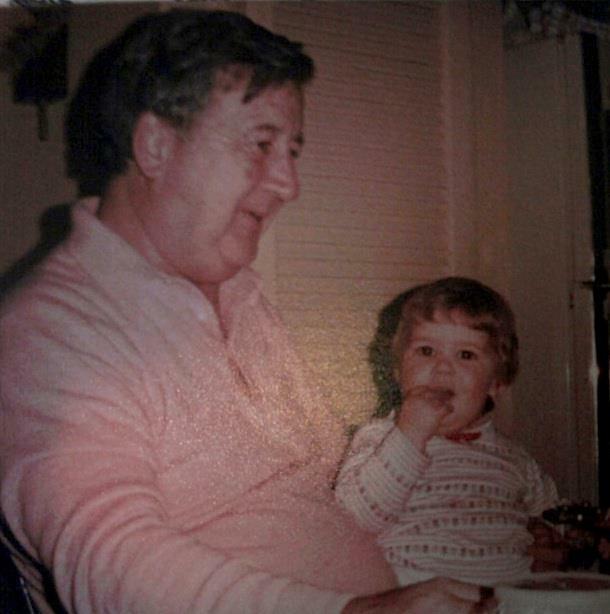 At each visit Poppy would make our favorite foods -- fried bread dough or homemade macaroni and cheese. And my beloved blueberry waffles (which should qualify more as dessert than breakfast) -- homemade waffles right off the iron, warm blueberry pie filling and a scoop of vanilla ice cream. He made sure to include these on the menu during one of my last visits up there -- sitting on a chair next to the kitchen counter, manning the waffle iron because he was too tired to stand the whole time. I was thinking about Poppy as I was driving back from mom and dad's house where my sister Sarah, her husband Lukas and daughter Penelope were visiting today. My parents made brunch -- dad baked fresh scones and mom whipped up a breakfast casserole -- and the girls watched the trains circling the Christmas tree and chased each other -- the clatter of small feet and shrieks of laughter filled the house. Joyful music after such difficult days. It brought back fond memories of Poppy's house. It occurred to me as I was staring at the gray sky over the Susquehanna that Poppy was probably on the welcoming committee for those 20 babies who left their parents on Friday. He almost certainly wrapped them each in a big hug and then showed them over to a table stocked with crayons and coloring books and plates stacked with waffles dripping with ice cream and blueberries. I smiled a little at the thought. Something sweet out of something so terrible.